I was on pins and needles waiting for this bag to arrive. I have never backed anything on a crowdfunding project before and I was worried about the process and if I would get my product in time for an upcoming trip. Cotopaxi did NOT disappoint - shoutout to the customer service Llamas. Y’all are fantastic! I ordered the Allpa pack in July in hopes that it would arrive in time for me to take it on my New England trip. I kid you not, I received it 10 hours before I had to leave. Cue a mad dash and throwing things around my house trying to pack everything. So what’s so great about this backpack? The Allpa pack is a 35 liter pack that was designed specifically for on-the-go travellers who want to skip the hassle of bag checking. Every inch of this product was mindfully created to work well when you are travelling through an airport or a busy city. When you first look at the pack you see nice rugged nylon exterior with a magnificent llama on the front. All the zippers and lash loops around the pack are sturdy and reinforced. I was really impressed that all the zippers are actually metal instead of the junky plastic so many bags have these days. You can definitely feel that this bag will hold up. Along each side of the bag there are handles so that you can easily heave it up into an overhead, carry it through the airport not on your back, or shove it in a trunk. Each of these seem really sturdy. If you’re traveling through a crowded city, the threat of theft is unfortunately a possibility. Cotopaxi has that covered. Each zipper has a anti-theft loop that the zipper pull fits through so that anyone trying to get into your bag is stopped immediately. The next thing you’ll notice about the pack is the heavy duty backpack straps and hip belt. These things are extremely comfortable and have all the same features that you’re 65 liter backpacking pack have. I had to carry this bag through two airports, Boston streets, and the subway and it was just as comfortable as my Osprey! There’s a small zipper pouch on the hip belt that was perfect for holding my ID and boarding pass and later on, a granola bar. On the front is a deep pocket that has two mesh dividers in it so that essentials are easily accessible. There is a second zipper on the side that houses two padded compartments. One for up to a 15 inch laptop, and a second for a tablet/ipad. I also found it was the perfect size and structure for keeping a couple magazines for when boredom strikes. The most obvious feature you see is that when you open the main compartment, it lays out like a standard carry on suitcase. This makes packing quickly a breeze. Both sections have a mesh cover that zips up and holds everything in place. In the right side - which is the deepest section that holds most items - there are cinch straps that compress everything so you can zip the bag easier. When I ordered my bag, I opted for the accessory kit which included a mesh laundry bag, a nylon shoe bag, and also an attachable mesh water bottle holder for the outside of the pack. These definitely came in handy. In the left side is a place to store the SECOND BAG that pairs with the Allpa. The Batac daypack slides right inside so you can stow it away for when you arrive at your destination. Then you're able to take the smaller day pack around on your adventures while your larger Allpa stays at home. I haven't had a new daypack since I bought my Osprey "daylite" about four years ago, so this was a breath of fresh air. It has easily accessible pockets and super fun one-of-a-kind colors. I definitely was on the side of over stuffing the pack when I was running around Boston and Acadia, but it held up so well even when I was stressing it's capacity. If you're thinking about purchasing the Allpa without the added Batac pack, I would think twice. The pairing is certainly helpful. Overall, I give this pack a 9.99/10 rating. My only tiny complaint is the fact that there is no specific camera padded pocket. I think these days most travelers have an SLR in their exploring arsenal. I was able to pack my camera with a sweatshirt around it with no issues, and all the added pockets held my batteries and memory cards perfectly. 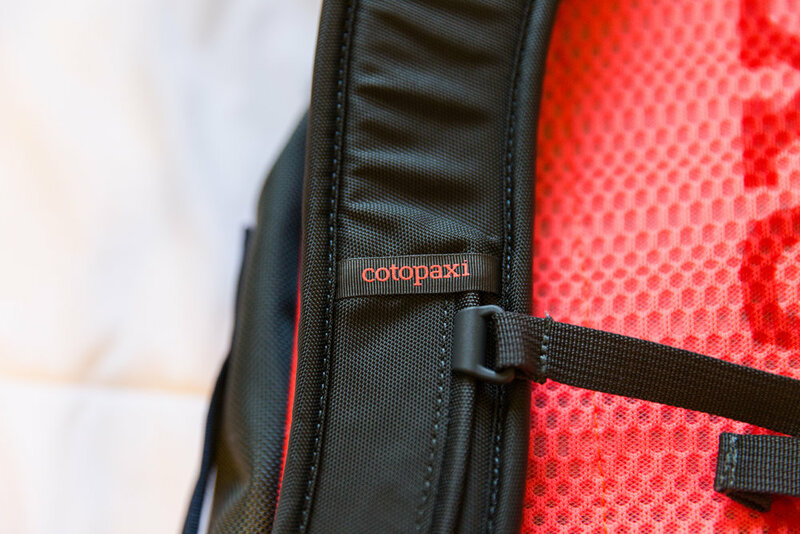 I think if Cotopaxi were to add a camera pocket or insert this would be a perfect bag. It's sturdy, fun colored, secure, and expertly designed for hectic travel. It's going to be in my gear closet for years to come! *This is not an advertisement or an endorsed review. All views are my own and all merchandise was purchased with my own money.